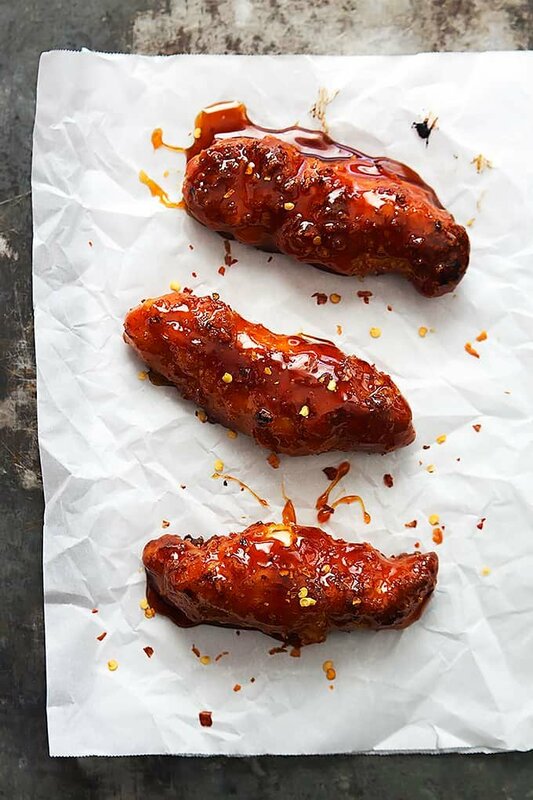 Super easy Baked Firecracker Chicken Tenders with the most amazing sweet and spicy Asian sauce – plus they’re so much healthier than the fried version! Heyyyyyyyyyyyyy friends. How’s the weekend treatin’ ya? Gone too fast? I know what you mean. All week long I fill little colored sticky notes with lists of things I really need/want to get done on over the weekend and then all of a sudden it has come and gone and I find myself scratching my head thinking… what on earth just happened?? A few good things did happen this weekend however. 3) first trip to buffalo wild wings – oh yeah. that happened. Overall, I’d call that a weekend well-wasted. Okay now about these chicken tenders. First thing you’ve gotta know is how crispy-tender-juicy they are and they are NOT FRIED. I just love saying that. They’re baked, not fried and as a true connoisseur of chicken tenders, I do not miss the usual fried ones. And I’m serious about that connoisseur title – at 7 years old I never wanted pancakes from iHop, just chicken tenders and fries please! Annnnnywhoo. The sauce. 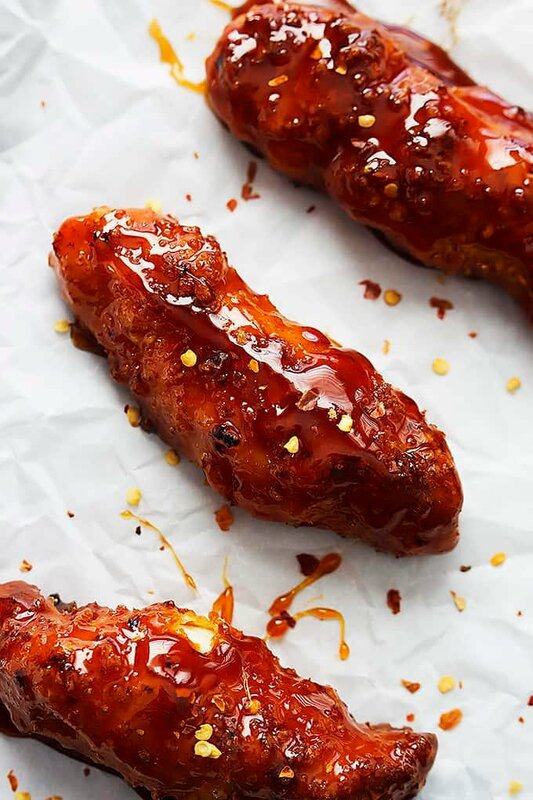 Let’s talk about ooey gooey sticky sweet and spicy sauces that make you want to cry they are so wonderful. Actually that pretty much covers it. No talking needed! And I swear that sauce-splash was candid ^^^ – I did not strategically create it to draw attention to the firecracker-ness of these chicken tenders. 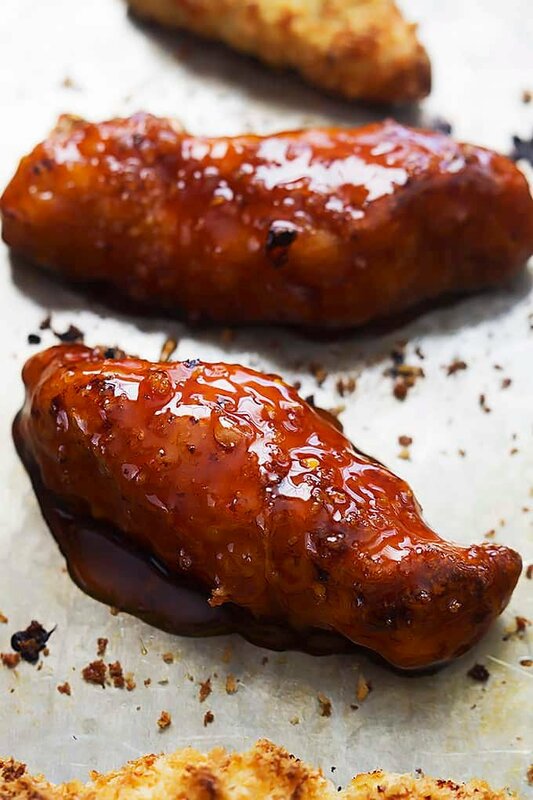 Baked Firecracker Chicken Tenders - so easy with the most amazing sweet and spicy Asian sauce - plus they're so much healthier than the fried version! Preheat oven to 425 and grease a large baking sheet with nonstick spray. Slice chicken breasts into 1-inch wide strips. Add flour and chicken strips to a large zip-lock bag, seal, and shake to coat chicken. Place panko in a bowl. In a second bowl whisk together eggs and water. 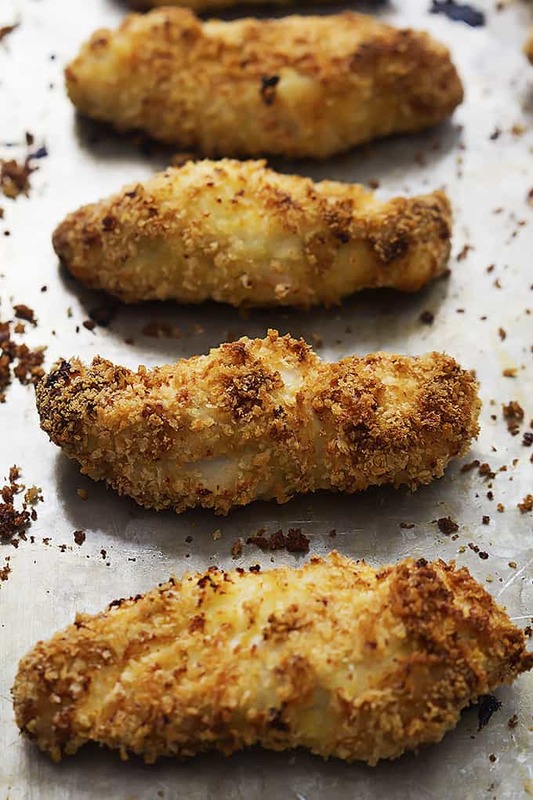 Dip flour-coated chicken pieces into the egg mixture to coat, then toss in the panko crumbs (make sure to coat well) and place on prepared baking sheet. Repeat with remaining chicken. Bake chicken for 15-25 minutes until golden-brown and cooked through. 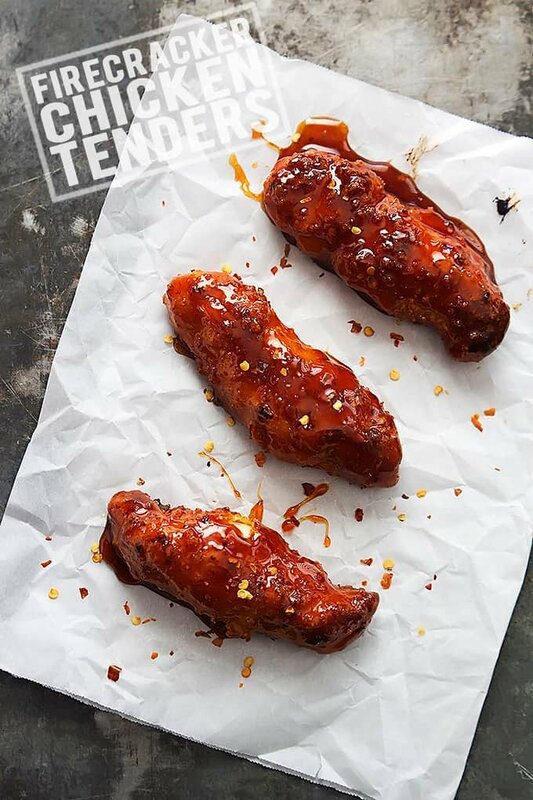 While chicken tenders are baking, prepare the sauce. In a medium sauce pan combine all sauce ingredients. Stir over medium heat for about 5 minutes, then reduce to low and allow to simmer until ready to use. When chicken is finished cooking, use tongs to toss chicken tenders in the sauce. Serve warm with ranch dressing if desired. 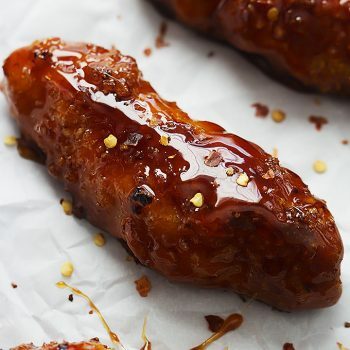 Try these other Wing Recipes you'll love! The guys in my life will die over these. Oh my, they look so delish! 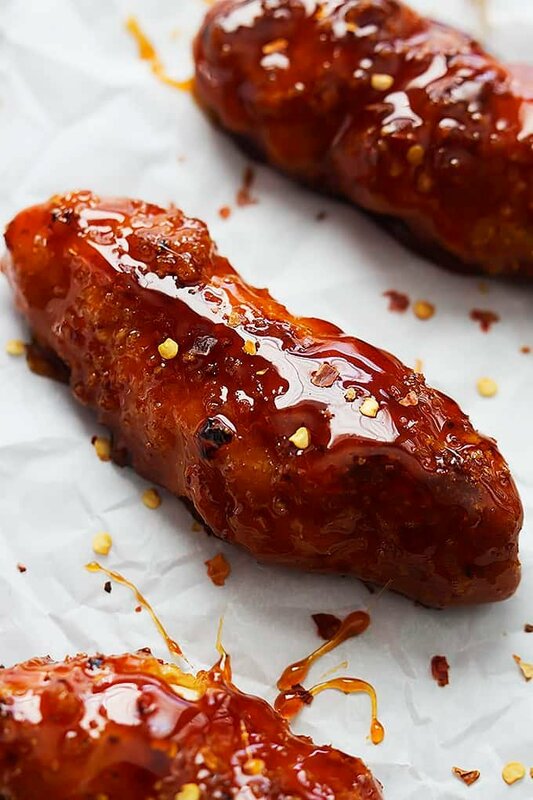 I fashion myself a chicken finger connoisseur as well, and I have to say, these look phenomenal! Tried this tonight and it was a big hit. We didn’t do the breading thing but the sauce was great. We grilled the tenders in my grill pan. Then added the sauce until it was thick and bubbly. Pigs must be flying because all my family devoted it. This hasn’t happened since I started making my own homemade spaghetti sauce. Huge hit. Thank you so much! Ha! Pigs flying…. every now and then there’s a miracle dish that pleases all the picky eaters! 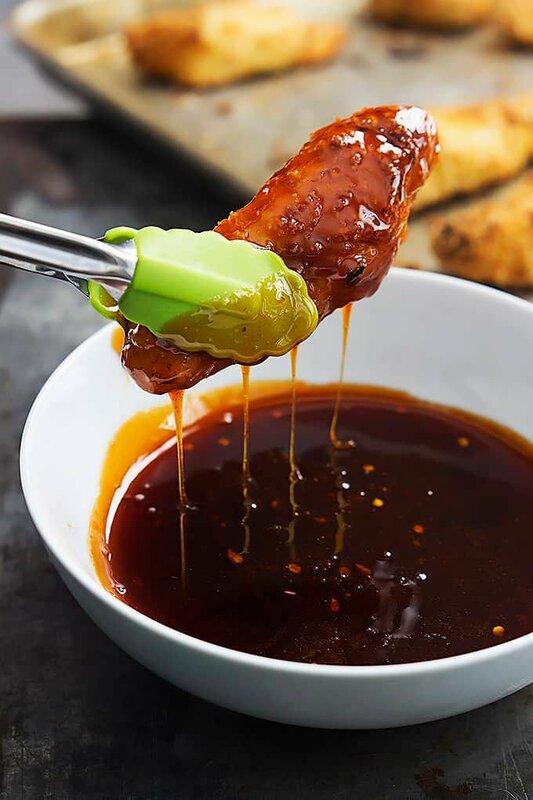 I’m so glad you liked this – I have to try grilled chicken tenders with this sauce I’m convinced that would be DELISH! I’m drooling. These would be my boyfriend’s new favorite. We love chicken dishes. I never miss the fried flavor either when I’m making baked and breaded chicken. These look incredible. I love that they are baked. And that sauce has my mouth watering. Pinning! This was delicious! I hadn’t paid attention that it had an Asian flair. My 13 year old foodie knew it right away. A big hit! Does someone could translate in French this wonderful recipe? I made these tenders with baked fries on the side over the weekend for my boyfriend he ate them without the sauce & thought they were good. Also for some reason he decided to place the tenders on wheat burger buns with lettuce and cheese which to my surprise was good haha. I will definitely be making this again I loved the sauce it had a good kick to it. I made these tonight and it was the BEST CHICKEN TENDERS EVER! If you are thinking about making these stop thinking, and make them. The chicken was amazing and the sauce took it to a whole new level. Also, if the sauce is too spicy for some in your family don’t dip all of the chicken and serve the plain tenders. I have made several things from your site and EVERY time it turns out amazing. Thank you for such great recipes and ideas. I love that you try to keep things a little healthier without going crazy! Keep up the great work! Ha thanks so much Lisa!! I try to live on middle ground – I definitely indulge but try to be healthier whenever possible, it creates a great balance!! So glad you are enjoying my recipes Lisa thanks so much for taking a second to leave such a sweet comment!! Delicious. I added a dash of ginger and about a teaspoon of sesame oil for a little more asian flavor! Definitely adding those next time, great idea Meg! I have made the firecracker sauce so many times now. Just love it! Really great recipe. Just made these tonight and they were absolutely delicious. And so easy to make too! I had some leftover sauce. Saving it to top burgers tomorrow. Can’t wait to make this again! Hi. I have chicken tenders, a little under a pound. Do I still use the same amount of the ingredients? Can you freeze leftover firecracker sauce? I am making this for tonight’s dinner, it looks tasty, but I don’t understand how anyone can call this a “healthy” meal when there is over a cup of sugar! That’s 13 teaspoons PER SERVING! That’s more than a can of Sprite, way more than a can of Coke. I also added sesame seeds and sesame oil and Chinese cooking wine for a more authentic taste. These were very easy to make and very tasty. The sauce had just the right amount of heat. The sauce tasted strongly of the hot sauce, which was a little much for me personally, but overall a very good and easy dish without a lot of mess to clean up afterwards. An easy weeknight meal! I just made this sauce. Omg. The best sauce ever. Put it on everything. This was very good! The one thing i NoTice about some of these recipes is that they are very vinegar heavy; i dont think ill Make this sauce again but to anyone wanting to make it, just use one tBsp of vinegaR- its more then enough 🙂 otherwise, i will definately make the chicken strIps again with a different sauce; they were verY good!